For those unfamiliar with the story, King Lear is about aging, senility, madness, family, cruelty, and loyalty. Lear, in his old age, decides he can’t be bothered to actually rule the kingdom anymore and wants to remain king in title only, so decides to split up his kingdom and give it away to his daughters in accordance with how much they say they love him. Goneril and Regan are all over this, waxing lyrical about how much they love their father, but Cordelia doesn’t want to play that game and is just like “dude, Dad, I love you like a daughter, you know that, I’m not gonna say I love you more than any man ever cuz uhh I’m gonna have a husband someday and that would be weird” (I’m paraphrasing). Lear gets pissed, banishes Cordelia (who conveniently goes off to marry the king of France), gives his entire kingdom away to Goneril and Regan (and to their respective husbands, Albany and Cornwall), and then sh*t goes from bad to worse because the elder two sisters are dicks who don’t want to deal with their dad getting senile. There’s a parallel story going on about Gloucester and his sons Edgar and Edmund – Edmund is the illegitimate son who convinces Gloucester that Edgar’s out to kill him, so Gloucester banishes Edgar who has no idea that Edmund is the one who set him up. Gloucester and Edgar end up wandering the heath together, Gloucester blinded after a scuffle with Cornwall, and Edgar disguised as a crazy beggar to avoid capture. All but three characters end up dead. I could go on but I won’t because time is of the essence and you’re all busy people. So the first step in designing (after a rather lengthy and involved breakdown, that is) is deciding what themes to focus on, and to decide when and where the story makes sense. For me, the whole set up is crazy – on what planet is this a good idea?! None. 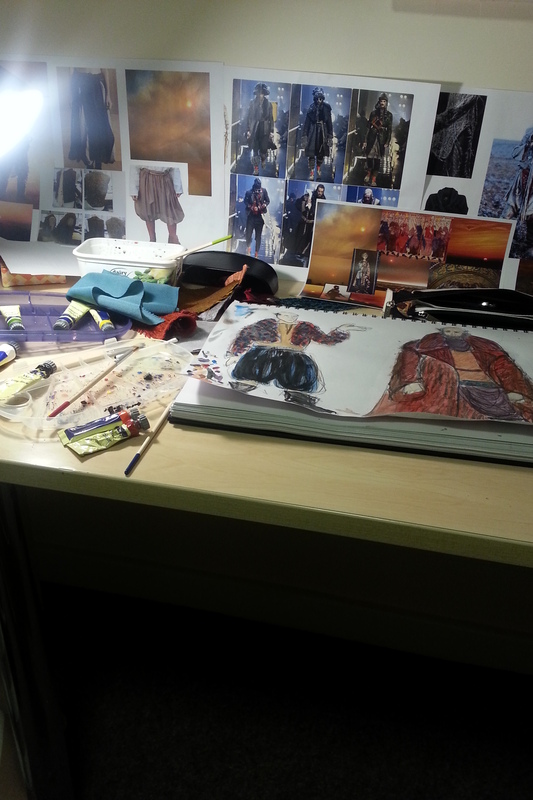 None that are recognisable to us anyway, which is why I chose to set my Lear in a post-apocaplyptic environment. 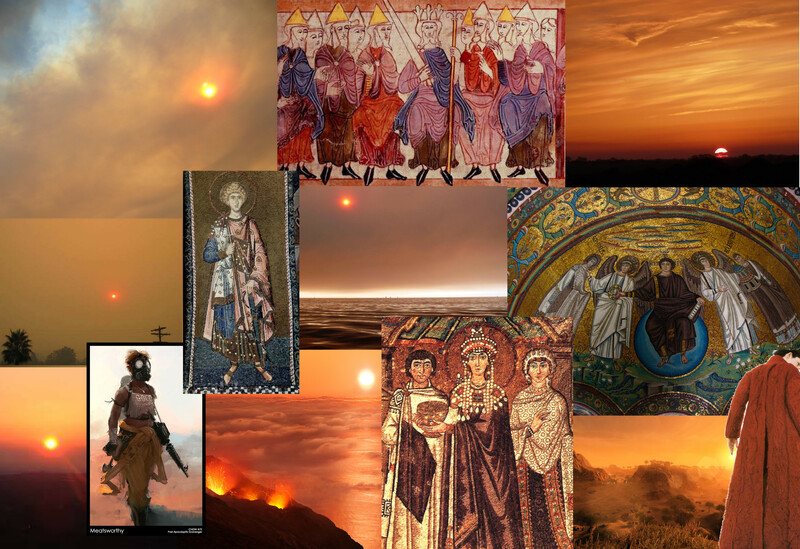 Maybe a giant meteor had hit the earth, filling the atmosphere with ash, turning the sky orange and the sun red. This mega disaster also fits in with the idea of entropy; that is, that the universe is constantly moving toward a state of complete chaos. The world of King Lear is chaotic and senseless; there are no gods to return things to an ordered state; the good guys end up as dead as the bad guys. It’s unjust, but it’s nature. My main approach, without being too period, was to focus on garments that could be simply constructed and cut from a single length of fabric (square cutting from week 2, anyone?!). I figure that in this post-apolcalyptic environment, resources are limited and they have to be clever about using what they have – hence the Asian style trousers for the men, and the Medieval dresses for Regan and Goneril. I attempted to update the look with quilting and cording for the men, along with motorcycle-style boots, but in the end I don’t think it came across that well. After presenting my work to the tutors and first year BAs yesterday, the feedback was that my designs are a good starting point, but the post-apocalyptic, scavenged element could be pushed a lot further – at the moment they feel far too period. 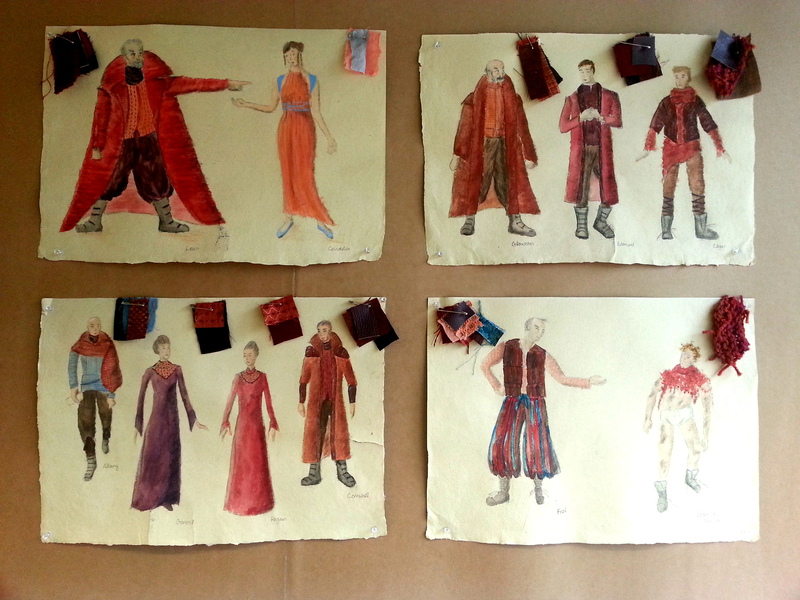 Maybe I shouldn’t have admitted that I designed Lear’s coat to be an updated version of a Henry VIII gown (week 3 anyone?!) – a big sweeping silhouette with a yoke back and oversleeves, but also a massive collar and lapels to update it and make it look more modern. Maybe I should have given Goneril and Regan short cap sleeves? But then that would have felt too casual. I was super excited to present my work yesterday, but came out the other side a bit deflated and disappointed that I couldn’t express myself better. Yes, I said “post-apocalyptic” and “scavenged,” but really that’s not what I wanted for a group of royal, powerful characters (which I did explain, saying that if I had explored the working classes or peasants of that world I would have incorporated more scavenged elements). What I should have said, but didn’t, was that the strong period reference was an intentional choice to show how humanity has had to start over again, and this is the point they’ve got to with that’s available in their environment. Maybe watercolour on banana paper (yes, it’s made from bananas) wasn’t the right rendering style to evoke a simmering, dystopian future where things are about to spiral out of control. Maybe I should have said, it’s King Lear on Mars. But it’s all a process – as MA lighting designer Joe rather succinctly put it, we didn’t come here to be told we’re brilliant designers. So next time, I’m going to practice my presentation ahead of time to make sure that I can confidently express my complete idea, rather than a half-baked on-the-spot version that makes it look like I didn’t achieve what I wanted. AND I’m going to spend more time drawing and experimenting, because as I’ve discovered in the last two weeks, that’s where a lot of the ideas come from.